There were some great projects ladies shared at the Breakfast Club. 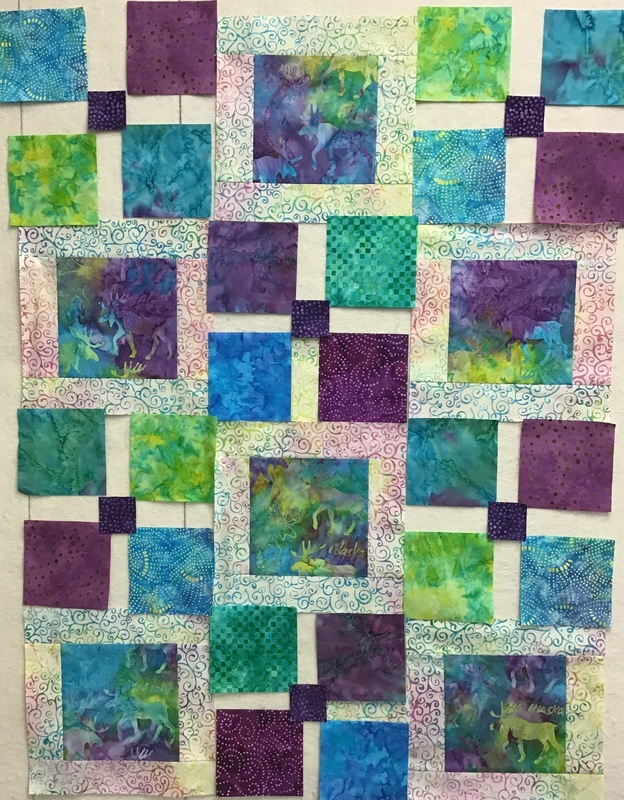 Here is Meg's One Block Wonder. I scolded her for not having the original, uncut fabric with her so we could compare. 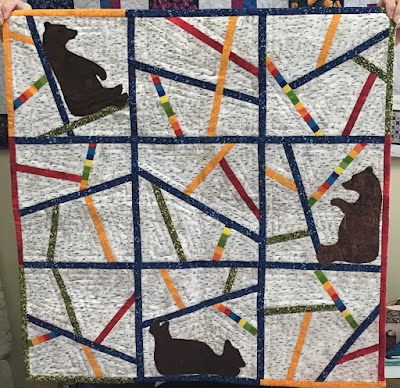 Jackie's adorable Bears in Birch Trees quilt. 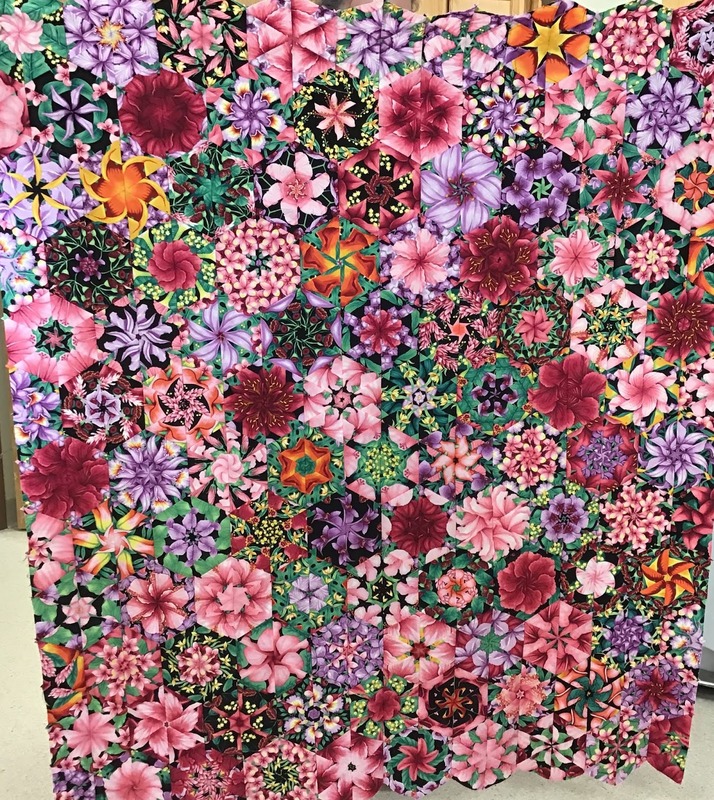 I don't know the actual name of this pattern. 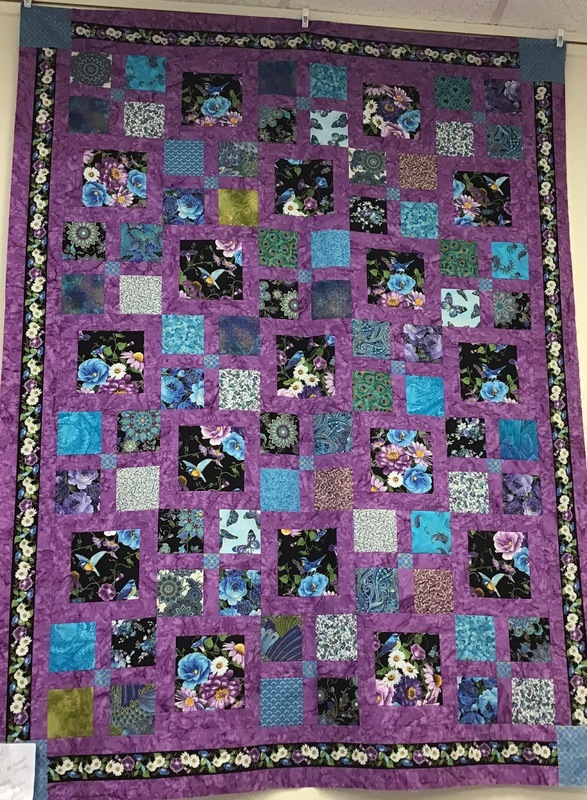 Her lucky grandson will get this beauty. 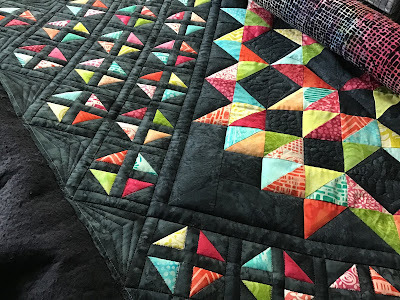 "Perfect 10 Quilts," by It's Sew Emma. A layer cake pattern. 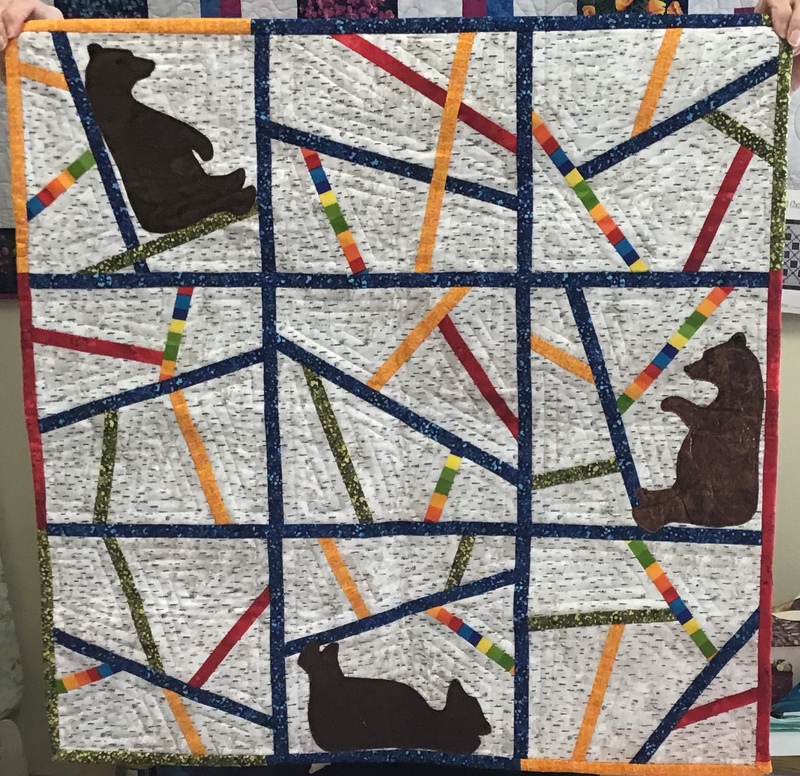 This month's project was, "Make It 8!" The pattern calls for a feature fabric, background fabric and 8 fat quarters. 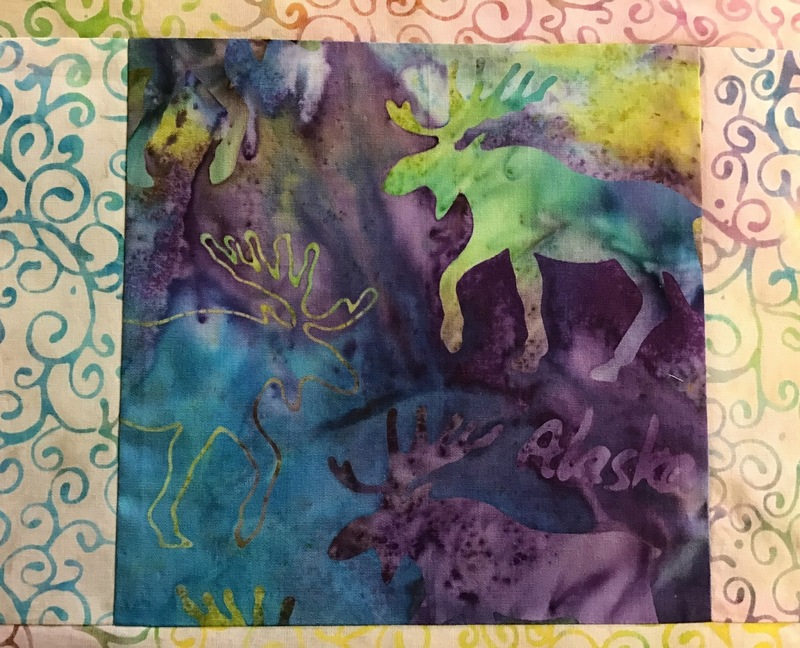 Marcia's class sample with a lovely border treatment. Rona had her top completed prior to class. 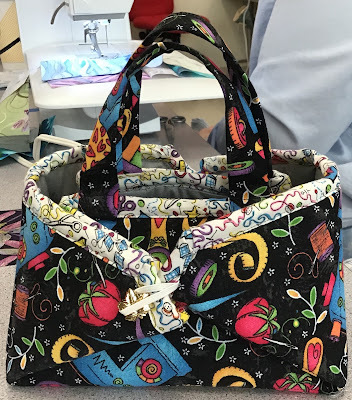 A lot of these ladies meet every Tuesday to sew which is great for me because I get to think about options for mine. 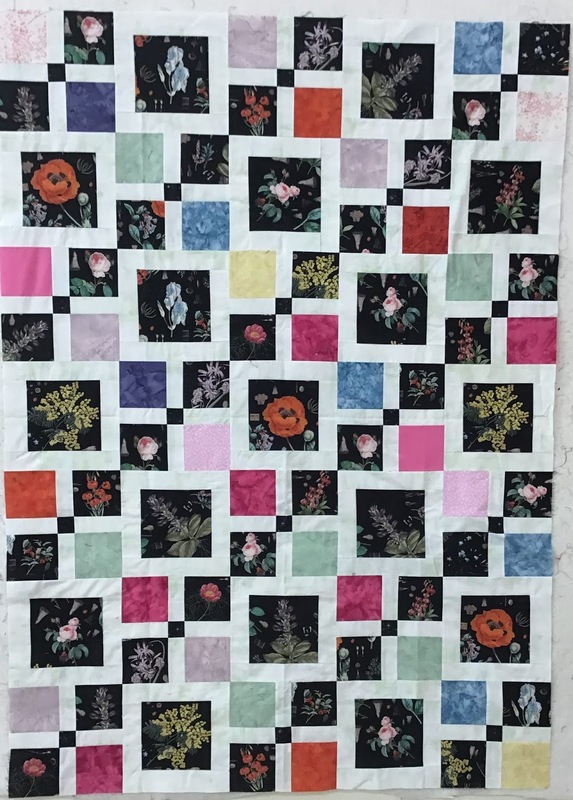 Joyce had her feature blocks completed before class and got the fat quarter blocks done and all her rows sewn together. 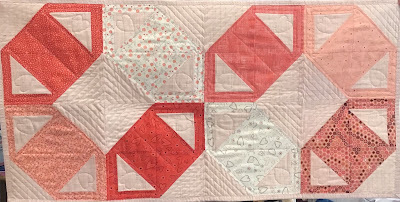 Laura made her quilt before class and cut the number of blocks to make a lovely baby-sized version. After seeing Laura's version I decided my blocks looked perfect for a baby quilt. 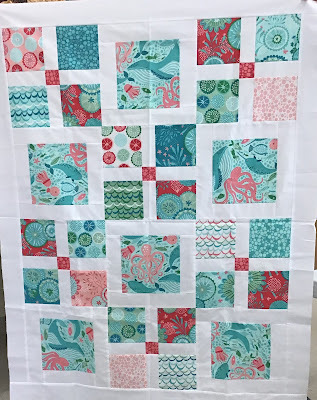 I might actually make two or three baby quilts since I had already made 17 feature blocks when I came to this decision. And I have plenty of background fabric to accommodate three baby quilts. I couldn't wait to tryout my blocks on the design wall when I got home. It wasn't quite like I pictured in my head once I saw it on the wall. 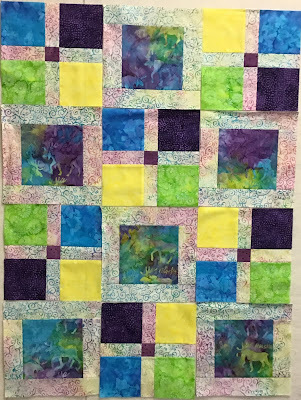 I loved the colors but the large sizes of the fat quarter fabrics overwhelmed my feature fabric blocks. because now I had to pull out my seam ripper. 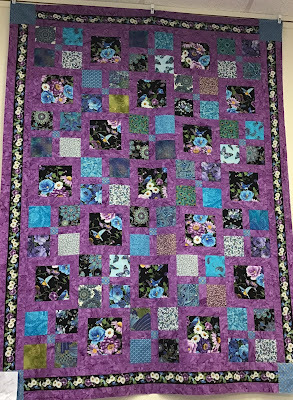 Below...a new version with dark purple 2-inch centers. After seeing the other quilts made in this pattern I came away with the observation that the 2-inch center square color made a big difference in the quilts I liked the most. 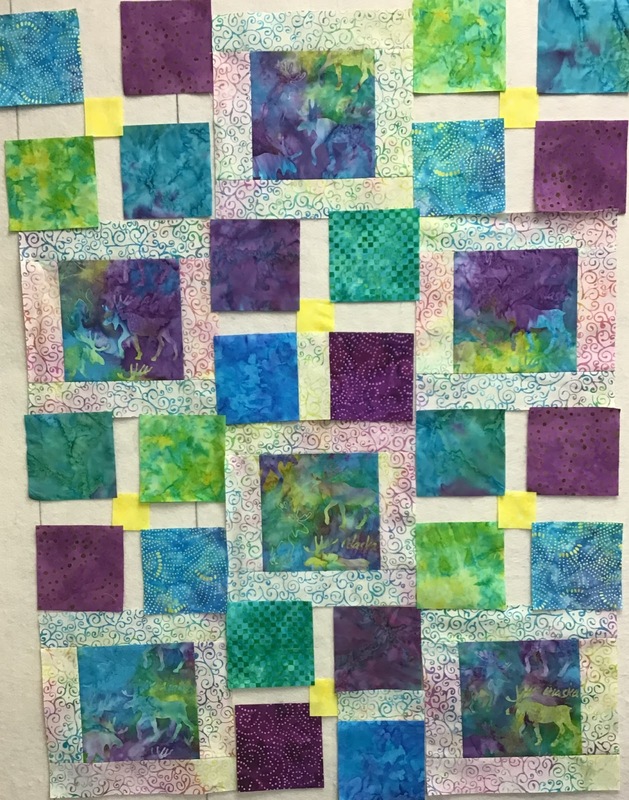 This is the same version with yellow centers. A little hard to see the moose in my feature fabric so here is a closer look. I even made changes to my design plan for the quilt on my midarm frame. 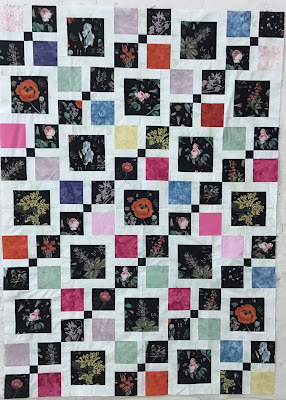 I don't like it as much as my initial drawing but because of all the seams in this tiny area I was having trouble executing it as I imagined so I simplified and succumbed to stitching in the ditch along all my HST 1 1/4-inch squares. Tedious. Two more corners to tackle. I'll finish all the black areas before moving to the star center. 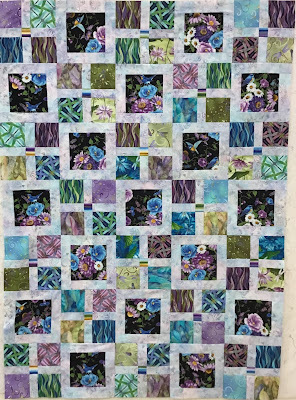 I was hoping to finish it by the end of today but it's too pretty outside to spend the whole day quilting. 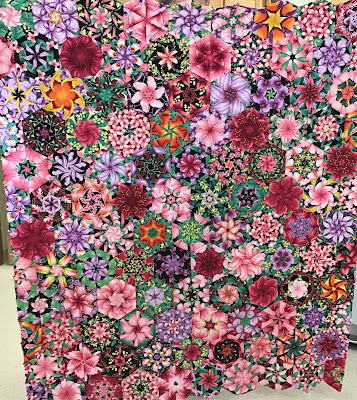 The top is just under 40-inches square. 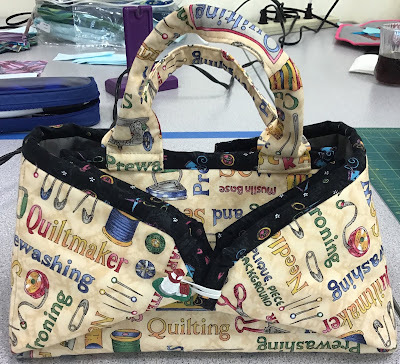 Yes, it can often be small changes that make big differences with quilt making. I agree that a strong coloured 2in square makes all the difference... anchoring the surrounding fabrics and squares. Lots of fun projects underway. Beautiful pictures !! Congratulations all ! One day I will do a "one block wonder" too.... I have already bought the fabric !! :)))) Yep !! Oooo - That's a lot of SID (on the diagonal, even), and in black! That's putting you through your paces, for sure. But it's so very pretty.